By 2025, Maryland leaders want to ensure that at least 55 percent of state residents have a college degree.1 The benefits are clear. Increasing the education level of the workforce will help individuals achieve self-sufficiency and build a competitive and marketable labor force. This goal is ambitious as only 41 percent of Maryland adults currently have a college degree.2 To educate more residents, Maryland must strengthen its policies and programs to remove barriers for students who are falling through the cracks. Low-income and non-traditional students face the greatest barriers to completion, and affordability is high on the list of challenges. While most students need assistance to pay for college, they are often left with unmet need – in other words, a gap between what they can afford to pay, the aid they receive, and the total cost of college. Many face the tough choice of working more, seeking private loans, enrolling in fewer courses, not obtaining their degree or not even enrolling. While federal student aid plays a major role in college financing, state policy ultimately drives the cost of college. States also have a hand in driving program innovation and in directing state aid resources to the students who need them most. These are all challenges that Maryland can address through the lens of affordability. This brief examines the challenges facing students and institutions across the state. 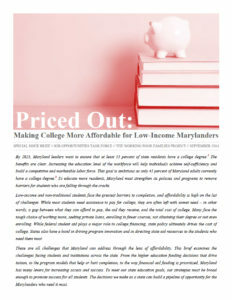 From the higher education funding decisions that drive tuition, to the program models that help or hurt completion, to the way financial aid funding is prioritized, Maryland has many levers for increasing access and success. To meet our state education goals, our strategies must be broad enough to promote success for all students. The decisions we make as a state can build a pipeline of opportunity for the Marylanders who need it most. For more information please contact JOTF at 410-234-8040.